Out June 15. Not a Pernice record, but a Pernice favorite. 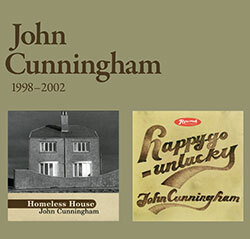 Released on Joe Pernice's Ashmont Records, a compilation of two of Cunningham's albums: Homeless House (2002) and Happy-go-unlucky (2002), plus an extra track from the sessions. If you pre-order from us by June 1, we'll send you a link for a free download of Joe Pernice and John Cunningham performing the latter's "Imitation Time" on Oregon Public Radio last summer. It's very good.